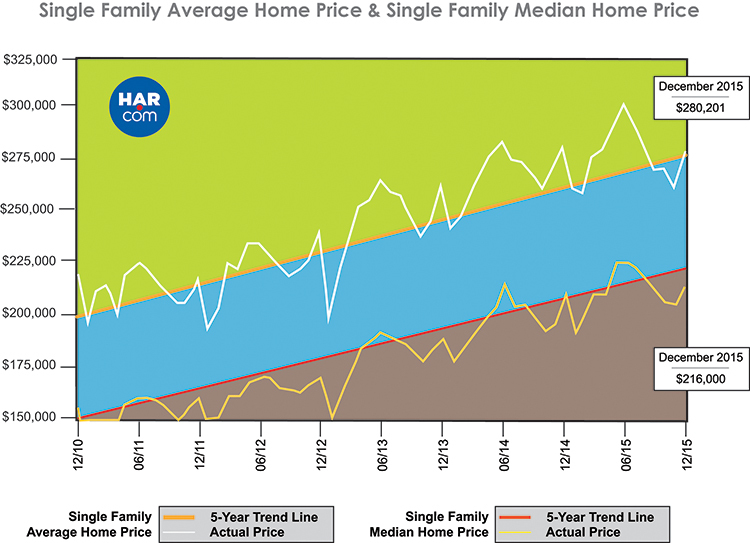 HOUSTON — (January 13, 2016) — Houston real estate faced a stiff challenge in 2015. It followed the best year on record for home sales. Add plunging oil prices and the resulting layoffs into the mix along with persistently low levels of housing inventory, and the result was the drop in sales that economists had forecast. While there were single-digit declines in sales volume at different times throughout the year, more substantial ones struck during the fourth quarter, including December. Nonetheless, the total number of 2015 single-family home sales as well as sales of all property types achieved the second-highest levels of all time, behind 2014. "With oil dropping to levels around $30 a barrel, I think its fair to say that the Houston housing market is going to remain cooler for at least a little while, said HAR Chairman Mario Arriaga with First Group. The good news is the local economy is vastly more diversified than it was during the oil bust of the 80s and other industries are continuing to hire, so it really is going to come down to consumer confidence." In December, the single-family home average price dipped a fractional 0.6 percent year-over-year to $280,201 while the median pricethe figure at which half of the homes sold for more and half sold for lessrose 2.9 percent to $216,000. The median figure represents an all-time high for a December in Houston. Single-family home sales fell 2.4 percent for the year and sales of all property types dropped 2.9 percent. On a year-to-date basis, the average price climbed 3.7 percent to $280,290 while the median price increased 6.5 percent to $212,000. Total dollar volume for full-year 2015 matched last years record high of $23.5 billion. 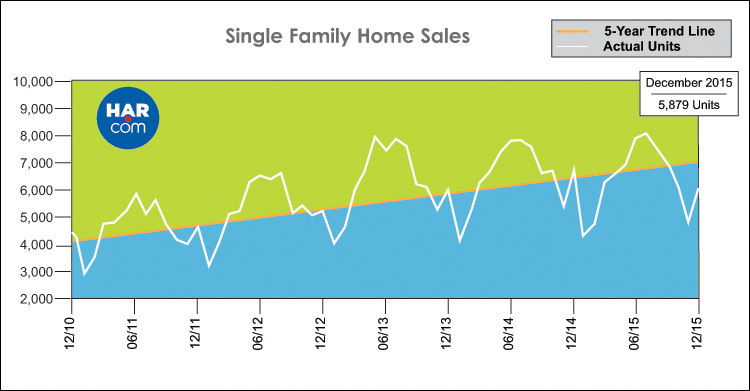 Month-end pending sales for single-family homes totaled 4,761. That is down 1.5 percent compared to last year and suggests the possibility of another sales decline when the January numbers are tallied. Total active listings, or the number of available properties, at the end of December rose 18.7 percent from December 2014 to 30,661. Houstons housing inventory has held above a 3.1-months supply since May 2015, getting as high as a 3.5-months supply during the summer months and settling at a 3.2-months supply in December. That compares to a 2.5-months supply in December 2014. The national supply of homes reported by the National Association of Realtors (NAR) currently stands at 5.1 months.